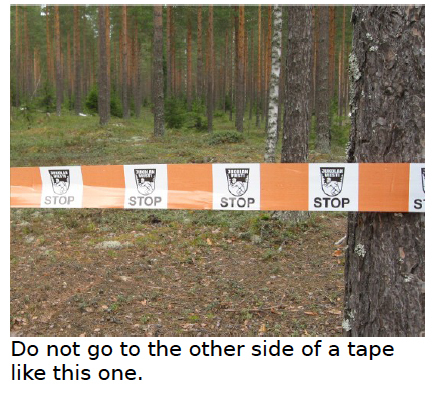 The rules of the Finnish Orienteering Federation (FOF) apply together with the instructions given by the organizer. The FOF’s rules for orienteering sports can be found in Finnish at http://www.suunnistusliitto.fi/ . The final competition rules for Kuopio-Jukola will be published on the results board and on the Kuopio-Jukola website on Saturday 14 June at 10 am. The competition terrain is located in Rytökylä, Vehmersalmi, some 50 km from the centre of Kuopio. The village of Rytökylä is in Soisalo, the largest island in Finland. The terrain consists of four distinct areas of hills and a narrow stretch of water. The Finnish word “vuori” at the end of local names like Huuhanvuori and Nousuvuori means a rather high hill. Consequently, the total climbs on the courses exceed the average values in the previous Jukola and Venla relays. The terrain in general offers easy running, but the courses may be strenuous due to soft ground in places. Occasionally there are slippery rocks hidden under a moss cover. There are also a couple of minor roads in the terrain. In the terrain, there are traces of logging carried out at various points of time, for example, tracks of logging harvesters. In addition, a heavy storm in 2013 resulted in a lot of fallen trees at the edges of open land areas, but most of the trunks have already been taken away. There are numerous high cliffs especially in the hilly areas in the northern part of the terrain. Dangerous cliffs are marked as impassable with symbol 201 on the map. 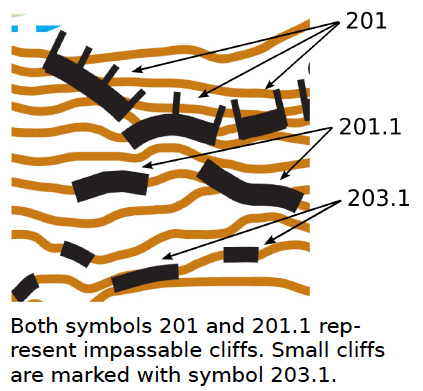 To improve the readability of the map, some of the impassable cliffs are marked with symbol 201.1. (See the figure.) The most dangerous cliffs are cordoned off with a white tape and another one with the text “Jukolan viesti – STOP”. You’d better be careful out there! In areas where there are a lot of boulders, the lowest boulder height marked with a symbol on the map is 1.4 metres; elsewhere it is about one metre. Somewhere in the terrain, there are constructions for TV broadcasting without a symbol on the map or in the control descriptions. The competition map is a six-colour orienteering map with marked bare-rock areas. The map is based on a laser scanning in 2009, and it was completed by Jussi Silvennoinen in 2010 – 2012. The final updated layout of the map was created by Juhani Jetsonen in 2013 – 2014. The map scale is 1:10 000, and the contour interval is 5 metres. The map was printed in March 2014. The control descriptions are printed on the map. The control codes can also be seen on the map next to the control numbers. The size of the map is A3 for both the Venla relay and the Jukola relay. The map is enclosed in a plastic cover. There is no previous orienteering map of the terrain, and nor is the competition map available before the start of the relay. In the terrain, there is a marsh that has been restored to its natural state. Being impossible to cross, it is marked as an out-of-bounds area on the map. House yards are also no-go areas, and so are cultivated land areas marked with black dots on yellow on the map. Other out-of-bounds areas, including forbidden roads, are indicated with vertical stripes in purple on the map. A continuous purple line on the edge of an out-of-bounds area on the map means that there is also a continuous do-not-go tape in the terrain. (See the figures.) There are also small forbidden areas like a bird’s nest in the terrain, not indicated on the map but cordoned off with a tape on the spot. The running order of each relay team must be registered on the Kuopio-Jukola website using club-specific login details. The deadline is at 6.00 pm on Friday 13 June for both relays, Venla and Jukola. A running order can also be registered as non-public, which means that it will not be published until the deadline of the registration. Thereafter it can be seen on the website. If there is an urgent need to change the running order after the registration deadline, the representative of the team will have to contact the Information Point and present their argument at the latest one hour before the start of the relay. The Technical Adviser will then decide whether or not the argument is acceptable. The team-specific competition material can be collected at the Information Point from 10 am to 10 pm on Friday 13 June and from 8 am to 10 pm on Saturday 14 June. The person who comes to collect the material must present a printout of the coupon emailed to the club or the team at the beginning of June. In addition, all the fees have to be paid, and the running order has to be registered. The material includes a number bib and an Emit card back-up slip for each member of the team. There is also a coupon against which the club or the team can collect a fresh set of competition maps after the relay. (There is only one such coupon per club, usually included in the material of the club’s first Jukola team.) If a team has hired Emit cards from the organizer, they will also be included in the material. Note that the material does not include safety pins for attaching the number bibs to the runners. Safety pins can be bought at the Information Point (3 € / 30 pc). The competition numbers (bib numbers) are based on the results of the Venla and Jukola relays in 2013. If a club has several teams, the first team of the club will wear the smallest of the club’s bib numbers. The competitor must protect the bar code on the number bib from damage until it is read at the entrance gate. The bib number must be visible throughout the leg. Removing it deliberately will lead to disqualification. Please attach the number bib carefully to the chest with safety pins; it will be checked at the entrance gate. Punching in the competition will be carried out with the Emit punching system. There are instructions about the system close to the Information Point. Because a single Emit card cannot be used on two consecutive legs, each team must have at least three Emit cards. An Emit card used by a team cannot be used by another team in the same relay, but a card used in the Venla relay can be used in the Jukola relay by any team. The team material includes an Emit card backup slip for each member of the team. You must write the letter J (for the Jukola relay) or the letter V (for the Venla relay) together with your team and leg numbers on the slip and then attach it to the Emit card with the text side outwards. The Emit card numbers are not needed at the team’s registration. The number of your Emit card will be registered when you have passed the entrance gate marked with the text “Suomen suurin kuntokoulu” (Finland’s biggest fitness centre) and your card is read for the results service. Thereafter you will have to insert the card into an Emit reset unit, which clears the card for your leg. After that the Emit card cannot be changed. If your Emit card cannot be read for the results service, you will be given an Emit card provided by the organizer. After finishing the leg, you must return the card to the Information Point, where you will be charged 10 € for using the card. Your own card will then be given back to you. After you have finished your leg, your Emit card will again be read for the results service when you pass the changeover area or the finish. If it turns out that there are shortcomings in your punching data, you will be guided to the Wailing Wall. A team can hire Emit cards in advance at 10 € per card. The hired cards will be included in the material provided for the team. Emit cards can also be hired during the competition at the Information Point. All hired cards must be returned in the same bag as they were on receiving them. Hired cards not returned will be charged at 80 € each. There are Emit card testing units next to the Information Point and the entrance gate. To test your Emit card, place it onto an Emit card testing unit. If you see a red LED light blink, your card is very likely to be OK. Sometimes it may happen that the red light blinks on a testing unit, but the voltage of the card battery is only just too low for the results service system. If that is the case, you will be given another card as explained in the previous section. Wearing spike shoes is strictly forbidden and will lead to disqualification. This will be controlled at the entrance gate and when competitors leave the changeover area. You are allowed to use dobb shoes, that is, shoes with metal studs on their soles. The organizer will make use of a GPS tracking system in both relays, Venla and Jukola. For each leg, the organizer will select about twenty runners from the fastest teams. They will be provided with tracking devices. If a selected runner refuses to carry the device, the team will be disqualified. The start of the relay will take place behind the map-stand rows in the start and changeover area. The access to the start area is through the entrance gate. After the Emit card registration, you cannot leave the area. There are toilets and a tap for drinking water in the area. There are separate instructions for the later starts (mass starts) below. The Venla relay will start at 2.00 pm on Saturday 14 June, and the Jukola relay will start at 11.00 pm on Saturday 14 June. In both relays the entrance gate will open one hour before the start. The competitors must be at the entrance gate at the latest 20 minutes before the start. Follow the orders given by the announcer and the officials on the spot. About seven minutes before the start, go to your place in the start grid. First look for the right row. Your place in the row is marked with your team number on a tape on the ground. Approach your place from the north-east end of the row. Wait there for an official who will give you a folded map. It is your responsibility to ensure that there is your team’s number on the map. The folded map is sealed with a tape. Opening it before the starting signal will lead to disqualification. If you arrive in the start area too late, you can get the map from an official after the starting signal. The Finnish Defence Forces will fire the starting gun. Do not move forward before it. A false start will lead to disqualification. The area is under video surveillance. There are more information about the start process on the Kuopio-Jukola website and in the Jukola booklet. The controls in the terrain are similar to the model controls close to the entrance gate and the Information Point. The controls have to be visited in numerical order. The controls for the first three legs in the Jukola relay are provided with reflectors to help finding them in the dark. The code and the number of a control are also printed on the map next to the control symbol. You may come across a control whose code differs from that of the particular Emit control unit. In that case you will see a different code on the card display if you have an Emit card with a display. There are points for refreshment and first aid in the terrain. They are marked with purple symbols on the map according to the specification for orienteering maps. In addition to water, sports drinks are available (Dexal). Note the litter bins for waste at those points. There is a refreshment point in the changeover and finish area, where you can also find a first aid crew. The actual first aid station is in the Competition Centre. There are guide signs on the changeover fence indicating at which section of the fence the changeover has to take place, depending on the team’s number. Look for the right section, and hand over the map to the next runner of your team. Note that the bib number must be visible all the time in the changeover area. You are responsible for taking the right map from the stand. The wrong choice will lead to disqualification. If there is no map for your team on the stand, contact an official, who will guide you to the reserve map stand by the changeover fence. You will be given a new map, but the lost time cannot be compensated. Only competitors wearing bib numbers are allowed to enter the Emit card registration point. A competitor coming from the terrain for a changeover can be seen from the changeover fence about 150 metres before the changeover takes place. In the area there are also online terminals that can be used to find out when and where the member currently in the terrain last visited an online control. There are also toilets and a tap for drinking water in the changeover area. If you arrive at the changeover fence so late that the runner of the previous leg has already left the fence and handed over the map to the officials, you can get it from them. They can be found at the changeover noticeboard at the end of the changeover fence. A competitor who has come from the terrain for a changeover cannot leave the area without visiting the Emit card data extraction point, where the card is read for the results system. The changeover times and the positions of the teams are based on the changeover punching. The changeover punching area is under video surveillance. Please pay attention to competitors who are moving in directions which cross that of yours. This applies to both sides of the changeover fence. Also avoid warming up in places where you might block others’ way. There is a marked route from the last control of the last leg to the bridge that leads to the Finish. The positions of the first fifty teams in the results will be determined on the basis of crossing the finish line, whereas other teams’ results will be based on the punching immediately after the finish line. (Note that the moment when the Emit card is lifted from the punching unit is decisive for the final time.) The finish punching is controlled by video recording. The Emit cards of the anchors of the teams that are to be awarded will be read immediately after the finish line, whereas the rest of the anchors will have to follow a marked route to the Emit card data extraction point. In the course of the relay, the results can be seen on the results board and on the Kuopio-Jukola website (/en). If there is a confusion regarding the results, please contact the Wailing Wall. Information about drop-out cases and disqualifications is available on the results board and also announced by the speaker if the case concerns one of the leading teams. The official results will be published on the website after the competition. The Wailing Wall can be found close to the entrance gate, and it is open from 1.10 pm on Saturday 14 June to 4.00 pm on Sunday 15 June. The Wailing Wall is the right place to report a rule violation or hand in a protest. Disqualification cases will also be dealt with at the Wailing Wall. If need be, the leader of the team in question will be summoned by means of a loudspeaker announcement. In spite of being dropped out or disqualified, a team may continue the race as if it were a real relay. The remaining members can carry out changeovers normally so that their leg times become recorded. However, if such a team is less than half an hour behind the leading team, the member in turn is not allowed to start the leg until the time difference is half an hour. He or she has to contact the officials at the noticeboard at the end of the changeover fence. There he or she will be given a map and a start signal when enough time has passed. A dropped-out competitor must return to the changeover area along the route marked for the finish and then go to the Emit card data extraction point, where he or she must inform the officials about the situation, after which it is regarded as a drop-out case. If the competitor is not able to do so, the team leader must contact the Wailing Wall and return the competitor’s map. In the case of an injury in the terrain, the map is given to the first aid personnel. These teams will also be listed on the noticeboard at the changeover fence. Coaches and people who want to help teams or individual competitors are not allowed to come to the start, changeover and finish areas. They can operate in areas provided for the public. A club can only pitch a wind shelter on a site booked and paid for in advance. The wind shelter sites close to the changeover area are reserved for the clubs whose Jukola or Venla results in 2013 were among the best ones (the first fifty Jukola teams and the best ones in the Venla relay). The remaining sites will be given on the basis of the booking order. Wind shelters must be pitched so that they do not block the paths in the area. The wind shelters cannot be used for accommodation. In the area it is not allowed to make any kind of fire, including all kinds of stoves for camping or backpacking. Possible interviews with competitors can take place after the competitor has visited the Emit card data extraction point or later at the Media Centre. There will also be a press conference for the best teams in both relays as soon as possible after crossing the finish line. The teams will be informed about the press conference. The top 25 Jukola teams and the top 20 Venla teams will be awarded with medals or plaquettes in prize ceremonies on the festival stage. Honorary awards will also be given. For the Venla relay, the ceremony will take place in the Jukola Festival starting at 7.30 pm on Saturday 14 June, and the Venla teams to be awarded will be asked to be seated next to the stage by 7.20 pm on Saturday. For the Jukola relay, the ceremony will take place at 9.30 am on Sunday 15 June, and the Jukola teams to be awarded will be asked to be seated next to the stage by 9.20 am on Sunday. The teams to be awarded are not allowed to carry anything whose purpose is to advertise something. However, the club’s banners and badges are permitted. The team-specific material includes a coupon against which the club or the team will be given a map that shows all controls, including the forked ones, for the club’s all teams. There will also be fresh maps with overprinted courses for the team’s members. (If a club has several teams, the coupon is included in the first team’s material.) The maps can be collected at the Information Point from 9.20 am on Sunday or immediately after the mass start. The club’s maps can also be posted, provided that an address has been given to the Information Point and a fee of 10 € has been paid there. An extra charge according to the price list at the Information Point will be applied if the parcel is large or has to be posted abroad. The traditional message of the Jukola relay will be read, and the receiver of the message will be announced soon after the winning team has crossed the finish line. The occasion will take place close to the finish area. There are about 1000 metres of marked routes on the courses, and there are forked controls on all legs. Young competitors born in 1998 or 1999 are advised to choose from legs 1 and 2. The start will take place at 2.00 pm on Saturday 14 June as a mass start for the first leg. The competitors must go to the Emit card registration point at the latest 20 minutes before the start. After the registration and the Emit card reset, the competitors go to the start area, where they act as described in the Start section. The Venla relay in its normal form will be finished at 6.30 pm on Saturday. A mass start for legs 2, 3 and 4 will take place for the teams that have not done all their changeovers by 6.30 pm. The mass start is due at 6.45 pm next to the map stands. The competitors must go to the Emit card registration point at the latest 20 minutes before the mass start. After the registration and the Emit card reset, the competitors go to the map stands about five minutes before the start, following the orders given by the announcer and the officials on the spot. A false start will lead to disqualification. The finish for the Venla relay will be closed at 10.00 pm. However, the total time will be determined for all the teams that finish the race in a due manner. There are about 1000 metres of marked routes on the courses, and there are forked controls on all legs. The sun sets at 11.17 pm on Saturday 14 June and rises at 3.02 am on the next morning. Young competitors born in 1998 or 1999 are advised to choose from legs 4 and 5. On a few legs, the competitors are expected to pass through an area not far from the Competition Centre. There will be announcements when this is about to happen to the fastest teams. The start will take place at 11.00 pm on Saturday 14 June as a mass start for the first leg. The competitors must go to the Emit card registration point at the latest 20 minutes before the start. After the registration and the Emit card reset, the competitors go to the start area, where they act as described in the Start section. The Jukola relay in its normal form will be finished at 8.45 am on Sunday 15 June. There will be two mass starts for the teams that have not done all their changeovers by 8.45 am. The first of them is for leg 7, and it will take place at 9.00 am. The second one is for legs 2 to 6, and it will take place at 9.20 am. The competitors must go to the Emit card registration point at the latest 20 minutes before their mass start. After the registration and the Emit card reset, the competitors for leg 7 go to the map stands about five minutes before the start, following the orders given by the announcer and the officials on the spot. The competitors for legs 2 to 6 are guided to a waiting area, from which they move to the map stands following the orders given to them. A false start will lead to disqualification. The finish for the Jukola relay will be closed at 3.00 pm. However, the total time will be determined for all the teams that finish the race in a due manner.